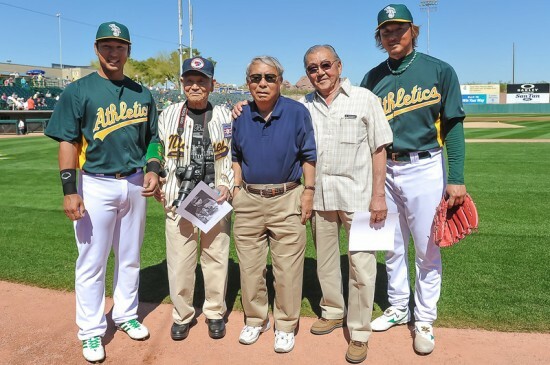 PHOENIX — On March 7, the Oakland A’s honored the legacy of Japanese American baseball prior to their Cactus League game against the Seattle Mariners at Phoenix Municipal Stadium. That date marked the 70th anniversary of the opening of Zenimura Field in the Gila River internment camp, located about 40 miles south of Phoenix during World War II, where some 13,000 Japanese Americans were detained. Japanese Americans already had a long tradition of community baseball leagues, and teams were formed in the camps to help boost the internees’ spirits. These teams sometimes played against teams from towns near the camps. 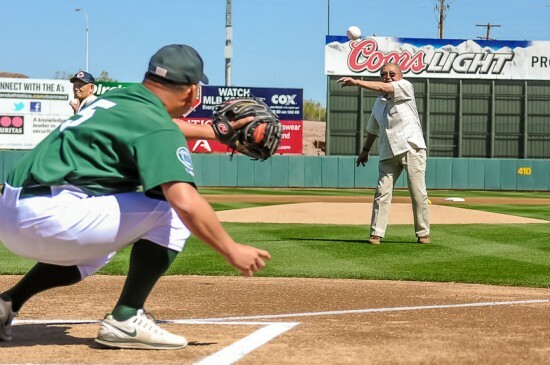 The game featured Japanese American baseball pioneers who competed on — and helped build — the historic Zenimura Field: pitcher Tets Furukawa, shortstop Masao Iriyama and second baseman Kenso Zenimura, whose father, Kenichi is widely considered the “father of Japanese American baseball.” Each threw out a ceremonial first pitch. Kenso Zenimura also played for the Hiroshima Carp of Japan’s Central League in 1953. More than 4,000 people attended the game, in which Oakland beat Seattle 7-3. Nakajima had two hits, drove in a run and stole a base. The game also featured Japanese American baseball trivia, contests and promotional giveaways. 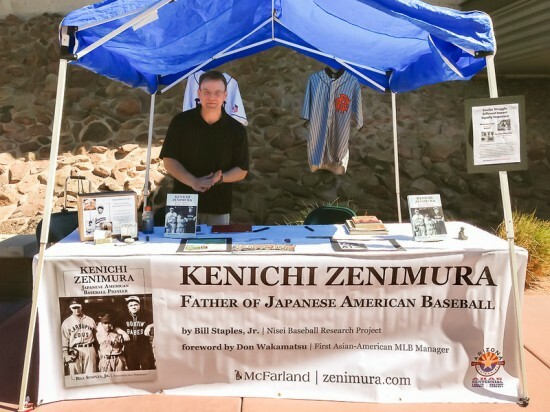 The Nisei Baseball Research Project, a non-profit founded to preserve the history of Japanese American baseball, offered an informational display at the stadium. 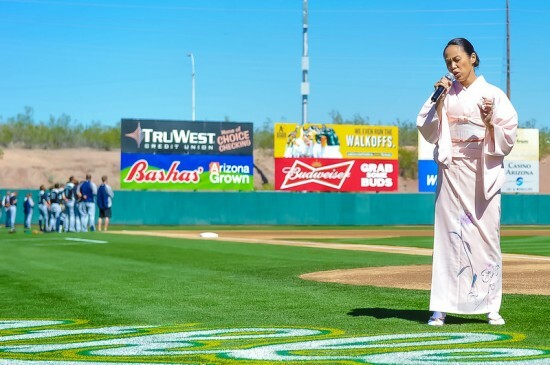 Festivities included renditions of “The Star-Spangled Banner” by a kimono-clad Yuko Elliot and “Take Me Out to the Ballgame” by Ken Koshio.